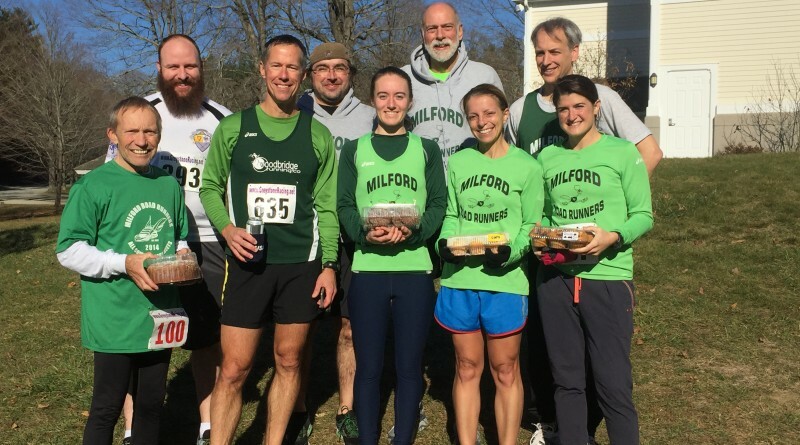 The Brookfield Running Company and SoundRunner Racing teams won the women’s and men’s, respectively, team titles at the 2016 Age Before Beauty 5k XC race in Litchfield, CT on Sunday morning; the race was the second in the USATF-CT Cross Country Grand Prix. Brookfield ran unopposed to take the women’s titles in both open and masters and the $175 that went with the victory while the SoundRunner men used a sweep of the top four spots to take the title. SoundRunner out-dueled Brookfield’s men’s squad and Milford Road Runners for the top spot. The win for the Brookfield ladies puts them into a tie for first in the overall standings and gives their Masters team a commanding lead. The SoundRunner men now hold a 5-point advantage in the team standings over Brookfield. The men’s Masters division saw a tie through three runners at 15 points apiece but it was the fourth runner for Brookfield that gave the team the title. Brookfield and SoundRunner are now tied in the masters division in the overall standings. The third race in the XC Series is Saturday, November 19th at the Hartford Track Club 8k XC Challenge in West Hartford.